North West Passage was released in the USA as Flame over India. Lauren Bacall, Kenneth More and Wendy Hiller. 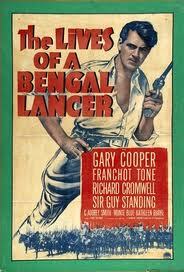 Geoffrey Unsworth's widescreen photography added to the film's sense of exotic adventure. A train engine (Victoria) plays a leading role in this movie. I.S. Johar in a scene-stealling performance as Gupta the train driver. 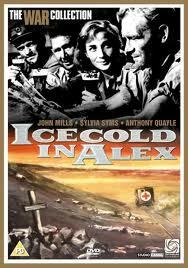 One of Thompson's best films, this combines character study, tension and adventure in a World War 2 desert warfare setting. Thompson is a much neglected director.He made his reputation as a scriptwriter and director in Britain in the 1950s. His subjects were interesting. They included crime, war, comedies and social dramas on such uncommercial topics as prisons, capital punishment and the pressures of modern suburban life. His 1959 film Tiger Bay (released the same year as North West Frontier) made a star out of Hayley Mills and won him a BAFTA for best British film. 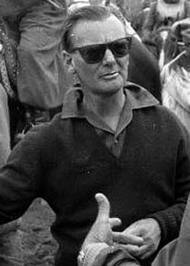 His ability to handle action, demonstrated in North West Frontier, and his reputation as an efficient, organised director who achieved good rapporte with his cast, may have suddenly gained him the opportunity to direct The Guns of Navarone (1961).This was enormous success and he went to Hollywood to work on many big-budget movies of the sixties. However, these did not enhance his critical reputation. Only one film stands out from this period - the thriller Cape Fear (1962), admired now by the likes of Martin Scorsese who later remade it. Thompson loved Hollywood showbiz, its parties and its money; his great potential, shown by the likes of North West Frontier, gradually dissipated. Thomson's filmography and career in detail. One reason for North West Frontier's success can be attributed to the movie's epic look, with its enormous vistas and foregrounding of action scenes against imposing and exotic natural backgrounds. The cinematographer was Geoffrey Unsworth, the man responsible for the lustrous looks of Kubrick's 2001: a Space Odyssey and Murder on the Orient Express and the expressionism of Cabaret. He was equally at home with epics like Becket, science-fiction/ fantasy, like Richard Donner's Superman or low budget thrillers like Hell Drivers (1957), director). The clip from Cabaret below demonstrates Unsworth's skill in using light and shadow to create an atmosphere and emphasize aspects of an actor's performance. The movie borrows some aspects of one of the most disastrous episodes in British imperial military history: the disastrous retreat of the British-Indian Army from Kabul, Afghanistan to Jalalabad in 1842. Only one British officer survived. One of those civilians who were captured on the retreat and held as hostage was Florentia Sale, the wife of the commander at Jalalabad, Major-General Robert Sale. This indomitable woman who kept a diary of the ordeal, teated the wounded and the sick and berated those she considered weak of heart was nicknamed 'the grenadier in petticoats'. In the movie the British are also besieged and forced to retreat to the nearest British fort, pursued by a relentless enemy intent on slaughtering soldier and civilian alike.. The group includes the redoubtable Lady Windham, whose capable soldier husband has been sent to command the fort. 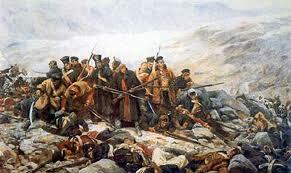 Painting of the retreat from Kabul. It took only three days for Afghans to kill or capture the retreating column of soldiers and civilians. 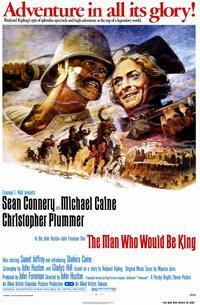 A Curry Western: Muslim tribesmen attack a railway train instead of Indians attacking a stagecoach. Englishman and Indian and railway engine carry the refugees to safety. The decrepit Empress of India is made ready by her engineer, Gupta. 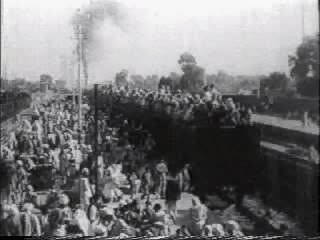 Refugees rush another train: a disconcerting parallel with the scenes following the partition of India in 1947. Crucial to North West Frontier are the roles of a rusty old train (locomotive) engine (significantly called 'Empress of India'), better known to its Indian engineer / train driver as 'Victoria'.The train, in the loving care of its engineer Gupta, becomes the only means of escape for a group of Europeans, and a young Hindu prince from a North West Frontier city besieged by Muslims who have overthrown the ruler.In order to reach safety 300 miles away the old engine with its one carriage must carry the refugees through rebel territory, fighting off angry tribesmen determined to stop the train and kill the prince and the passengers. The situation was the basis for Stagecoach and several other western films. But the train makes a fine substitute for a stagecoach, and the passengers contain a traitor and also display an ability with sharp repartee. Thompson's talent for pacing a film is obvious here; the buildup to planning the escape by train steadily builds up the tension. The dash to safety cleverly alternates scenes of external danger with scenes of tension between various passengers, and interesting revelations about them. 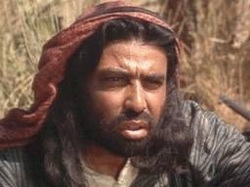 Johar in 'Lawrence of Arabia'. The train driver, played by I.S. Johar, who became a leading figure in early Bollywood, greatly adds to the film's appeal. His determined attitude, loyalty to his beloved 'Victoria' and perky personality are a winning combination. His success in this role was a step on the way to becoming a seminal figure in the history of early Bollywood. In the early postwar years he acted in numerous Hindi films, and appeared in some western films such as North West Frontier and Lawrence of Arabia. From the 1950s to the early 1980s he acted in dozens of Hindu and Punjabi movies. 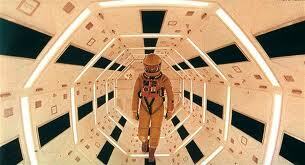 He also wrote scripts, produced and directed - many of them comedies. Johar became tremendously popular with such films, which often satirised the greed and foiblesof India's ruling and upper classes. Johar was a stalwart of early Bollywood cinema. Find out more. 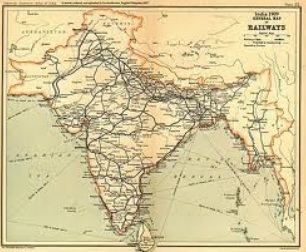 The railway network in British India, 1908. The Indian railways -and the little locomotive 'Empress of India' - play crucial roles in North West Frontier. According to Ray Ellis's article "Railway Films of the Raj" ,published in the Indian Railway Study Group Newletter No.9, January 1993. most of the railway sequences were filmed in Spain on the 5'6" gauge Zafra-Huelva Railway. It features "spectacular bridges and some very Indian looking scenery". 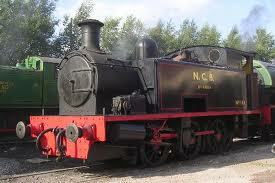 The "Empress of India" was a tank engine, an 0-6-0T built in 1900 for the South of Spain Railway. For filming sequences on the sound stage at Pinewood Studios, full size replicas of the locomotive, rolling stock and part of the bridge were constructed". 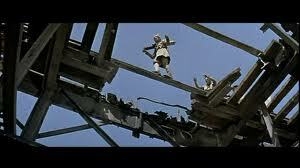 However, Ellis notes that several railway scenes were shot near Jaipur, India using metre gauge trains. "These include the departure of the 'refugee' train and the scenes where the 'escape' train catches up and passes the 'refugee' train." The leading roles played by trains and the railway system in the movie accurately reflects the important contribution the railway system played in the history of British India. The rail network built by the British was one of the most valuable and significant contributions of the British Raj. For the British rulers it insured more rapid dispersal of troops around the subcontinent to quell unrest. But it also helped unite disparate regions, stimulate economic development, provide jobs and improve communications over the vast subcontinent. An 06 0T class locomotive refurbished and re-employed. Calicut (Kerala) railway station, 1901. Part of the huge rail network of the Raj. 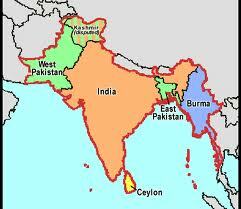 1947 -the partition of British India. 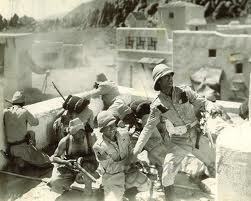 Although North West Frontier is primarily an adventure film, set in the very late 19th or early 20th century, part of its impact derives from its references to the consequences of British colonialism in India, and to the Hindu-Muslim tensions that eventually erupted into horrific violence during the end of British rule and the accompanying partition of the Indian sub-continent into India and Pakistan in 1947. Millions of refugees poured out of India and Pakistan; many used the railway system. Some of these refugee trains were ambushed by Hindu and Muslim religious fanatics. This movie is remarkably ahead of its time in other ways. The mixed race issue is essential to the last third of the plot, and is presented with considerable sympathy . So is the issue of Muslim attitudes towards violence as a way of achieving their goals. The morality of arms trading and its role in encouraging sectarian violence and war is also examined. Even the question of journalistic ethics is investigated. And - spoiler alert - at the end, when we expect the rescued young prince to be grateful to his British officer rescuer, he tells him that his mission, passed on by his father, is to eventually overthrow British rule. Remarkably, this serious moral/ethical baggage enriches rather than detracts from the enjoyable action-adventure aspects of the movie. The British colonial role in India, and its contribution to the disasters of 1947 and the subsequent tensions between Pakistan and India remains a source of contention decades later. The Scott -Van Leyden argument outlines the two basic positions. For some historians, British colonial rule not only provided the sub-continent with the benefits of modern Western life, such as railways which improved transport and facilitated famine relief. The British also tried to keep the traditionally warring Hindu and Muslim factions at bay. The British withdrawal meant disaster as communal antagonism erupted without the overlordship of the colonial power. The 1947 Daily Mail cartoon left shows this attitude.Conversely, other historians maintain that British control of such a huge area and vast population depended on a policy of divide and rule, and the manipulation of racial and religious antagonisms to divert attention from the mistakes of British rule. 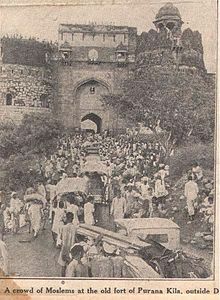 1947 Muslim refugees at Purana Kila. 'North West Frontier' - crowds outside the fort. Refugees on train 1947: note similarity to scene from movie above. 1938's 'Gunga Din', George Stevens' famous and influential movie about the action-packed adventures of British soldiers in India.